Several documents and reports are being prepared as part of Testing. Some are Test Strategy doc, Test Plan doc, Risk management Plan, Configuration management plan etc. Among these Test Summary Report is one such report which is prepared after the Testing is completed. 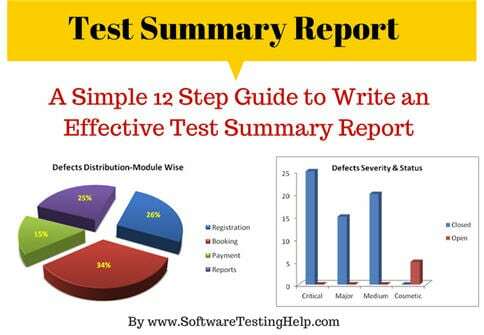 I have tried to explain the purpose of ‘Test Summary Report’ and provided a sample Test Summary Report template along with an actual report for download. What is a Test Summary Report? As we know, Software Testing is an important phase in SDLC and also it serves as the “Quality Gate” for the application to pass through and certified as “Can Go Live” by the Testing Team. Test Summary Report is an important deliverable which is prepared at the end of a Testing project, or rather after Testing is completed. The prime objective of this document is to explain various details and activities about the Testing performed for the Project, to the respective stakeholders like Senior Management, Client etc. As part of Daily status reports, daily testing results will be shared with involved stakeholders every day. But Test Summary Report provides a consolidated report on the Testing performed so far for the project. Assume that if the Client who sits in a remote location need to understand the results and status about a Testing project which was performed for a period of, say for example – four months, Test Summary Report will solve the purpose. This is also an artifact required to be prepared as part of CMMI process. What Test Summary Report Contains? A typical Test Report template will contain the below information, however, based on each Company’s format & practice, the contents may vary. I have also provided real examples for better understanding. At the end of this article, you can download a test summary report sample. Example: This document explains the various activities performed as part of the Testing of ‘ABCD transport system’ application. Example:‘ABCD transport system’ is a web-based Bus ticket booking application. Tickets for various buses can be booked using the online facilities. Real-time passenger information is received from a ‘Central repository system’, which will be referred before booking is confirmed. There are several modules like Registration, Booking, Payment and Reports which are integrated to fulfill the purpose. Example: A functionality verification which needs connectivity to a third party application cannot be tested, as the connectivity could not be established due to some technical limitations. This section should be clearly documented, else it will be assumed that Testing covered all areas of the application. Verification of connectivity with the third party system ‘Central repository system’ was not tested, as the connectivity could not be established due to some technical limitations. This can be verified during UAT (User Acceptance Testing) where the connectivity is available or can be established. <Describe the various types of Testing performed for the Project. This will make sure the application is being tested properly through testing types agreed as per Test Strategy. This testing was done whenever a Build is received (deployed into Test environment) for Testing to make sure the major functionality is working fine, Build can be accepted and Testing can start. This is the Testing performed on the Application under test, to verify the entire application works as per the requirements. Critical Business scenarios were tested to make sure important functionality in the application works as intended without any errors. Regression testing was performed each time a new build is deployed for testing which contains defect fixes and new enhancements if any. Regression Testing is being done on the entire application and not just the new functionality and Defect fixes. This testing ensures that existing functionality works fine after defect fix and new enhancements are added to the existing application. Test cases for new functionality are added to the existing test cases and executed. Admin control for defect management tool can be given to Offshore Test manager for providing access to Testing team. Each time the onsite Admin need not be contacted for requests whenever they arise, thereby saving time due to the geographical time zone difference. A repetitive task done manually every time was time-consuming. This task was automated by creating scripts and run each time, which saved time and resources. Smoke test cases were automated and the scripts were run, which ran fast and saved time. Automation scripts were prepared to create new customers, where a lot of records need to be created for Testing. Business critical scenarios are separately tested on the entire application which is vital to certify they work fine. b) All defects in Critical, Major, Medium severity should be verified and closed – Yes. c) Any open defects in Trivial severity – Action plan prepared with expected dates of closure. Example: As the Exit criteria was met and satisfied as mentioned in Section 10, this application is suggested to ‘Go Live’ by the Testing team. Appropriate User/Business acceptance testing should be performed before ‘Go Live’. Click here to download a sample test report template with an example. As part of Test Execution, collect all required information on the Testing performed. This will help to prepare a sound Test summary report. Lessons learned can be explained in detail, which will convey the Responsibility which was taken to solve these issues. Also, this will be a reference for upcoming projects to avoid these. Similarly, mentioning the Best Practices will portray the efforts taken by the team apart from regular testing, which will also be treated as a “Value Addition”. Mentioning the Metrics in graphics form (Charts, Graphs) will be a good way to visually represent the status & data. Remember, Test summary report shall mention and explain the activities performed as part of the Testing, to the recipients to understand better. Few more appropriate sections can be added if required. Test summary report is an important deliverable and focus should be to prepare an effective document, as this artifact will be shared with various stakeholders like senior management, client etc. After performing exhaustive testing, publishing the test results, metrics, best practices, lessons learned, conclusions on ‘Go Live’ etc. are extremely important to produce that as evidence for the Testing performed and the Testing conclusion. We have also made available the test report sample for download. It is a perfect example of how to prepare an effective test summary report! About the author: This is a guest post by Baskar Pillai. He is having around 14 years of experience in Test management and the end to end software testing. CSTE certified Testing professional, trainer, worked in IT majors like Cognizant, HCL, Capgemini and currently working as Test Manager for a large MNC. Please let us know your Comments/questions/thoughts. Sample Test Summary Report is missing. @Rameez, Sheetal – added the download link in article as well as in the comment. Sorry for inconvenience. There was an issue with our servers. I am into Embedded testing with 4 yrs of experience. I have very gud experience in Manual testing. Good knowledge Selenium and Perl(not used much in the projects as it is more of manual testing). I am not getting interview calls. Can u plz let me knw the current trend so that i can update on it. The Information shared is Very Good and Useful the people promoting to senior’s. Is it just me or I still have no luck downloading the file, getting the “Server not found” error. @Selvam, Vamsi-Thanks for the feedback. @Savitha- Tools like Selenium, QTP, Loadrunner has steady scope. You can also focus on ETL testing which has demand recently. SAP, Peoplesoft, Datawarehouse etc testing too have their own share of demand. For Automation tools – focus on the scripting part more. Any one plz explain ETL testing ? How to learn it? @Latha: There is an article titled “ETL vs. DB Testing – A Closer Look at ETL Testing Need, Planning and ETL Tools” published in SoftwareTestingHelp. You can also search for similar subjects in the website. It is great to everyone know about the test summaries even Developers. keep on posting your valuable article’s. I have been following this website for years to read new topics and enhance my knowledge in Testing. This article is very valuable as each release requires an execution summary. Keep posting !! Many Thanks Baskar for writing such a nice post, It’s really awesome. Wow. Great! Excellent posting ! @Suresh,Ravindra,Jaya,Bala,Edwin: Thanks for your feedback!!! Few peoples are there who take the ownership and move this ship ahead! I am working as BA, BNFS vertical.. Recently Client ask me to prepare template ‘Summary Test case’. I gone through your post and it realy awesome & Helpful. please keep in mind..the purpose of testing is NOT just to validate what is written in Functional Specification document, but to ensure the tested application is “Fit for Purpose” (FFP). @Abhishek-Good that this post helped you..Sure will try posting more..
@Sumedha – There are many formats followed in companies. This is one such format. Summary Report can be tailored to suit project requirements. Are test summary report and test closure same?? Now i am started my carrier in manual testing, what should i learn further. Can you please create the test summary report that you have so clearly articulated in an excel format. I have been reading your online help for years and this is one my favorite articles. Creating a test report excel including a dashboard, would be extremely helpful for those starting out as well as those who work in companies that do not have process; your report then can be use as a proof of concept to show testing status and hence the decision to setup and install TestLink. @Sachin: test summary and test closure are somewhat similar.It confirms completion of Testing. Thanks to all for your feedback..
@Atiana: Thanks for your feedback and suggestions. That’s a nice request. I do have few excel formats.These excel reports will be easy to create charts and graphs and of course Dashboards like.. Etc. If anyone still needs the copy pls email to usabaski@gmail.com. @Pradip – You can try Loadrunner for Load testing. The document is really good and it will help if some provide some PPT it will give some clear picture…anyway the content is great.. I am finding this article quite neat and useful to you all for the same. Metrics are often requested by management, but are usually useless and should be avoided. Think about what value the information has, e.g. “We planned 234 test cases, executed 198, 190 passed and 8 failed”. Does that mean anything? Were the 8 failures important or trivial? Are 234 test cases better than 233? Why did we not plan 235 test cases? etc, etc. While the general content is fine, as a BI professional I would strongly recommend avoiding the use of 3D pie charts to present data. Very Informative, However things like “list of knows” , “Test bed” information links etc are missing.